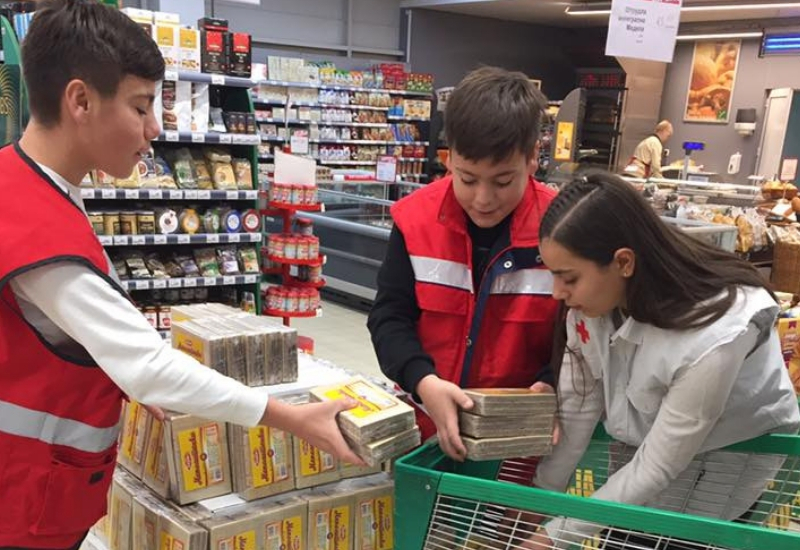 As a way of marking World Food Day (16th October), Red Cross in Shtip organized several food collection activities and created special coupons which citizens purchased to help the organization buy more food for socially vulnerable citizens. The final result came to an impressive 927 kg of food, which will be distributed to 90 families. World Food Day is celebrated across the world on the anniversary of founding the Food and Agriculture Organization of the United Nations. Many organizations use this particular day to raise awareness on the existing problems of hungry people, or those who do not have access to regular meals.The Food and Agriculture Organization estimates that 805 million people live in chronic hunger worldwide, 60% of women and nearly 5.000.000 children under the age of five die of chronic hunger. A similar initiative was also launched in Macedonia, earlier this month, whereby the supermarket chain Tinex will use its own resources to provide food for the most vulnerable families across the country. The activities of Red Cross Shtip, were of a more local character, and aimed at providing for the families living in Shtip and the surrounding area. They created special coupons, which citizens could purchase and so help the organization to buy food. A total of EUR 536 (MKD 33,000) was raised, which helped buy the biggest share. However, donations form Skopje Brewery and Kit-Go also made a big difference. “A detailed report from from the field activities notes a total of 927 kilograms of food, most of which was purchased with the 33,000 denars raised by the citizens. Supermarket chain Kit-Go and Brewery Skopje donated a part of its product range, enriching the content of the packages intended for families living at social risk”, said Viktorija Milanovska, Secretary of Red Branch Shtip. Milanovska also stated that the content of the care packages provided to the families was customized according to the number of members as well as specific needs, such as the addition of warm winter clothes. The information about the families was provided by the local Center for social work.